Overnight raid in Druze villages leads to three more suspects in 'lynch' attack on IDF ambulance, bringing total arrest count to 12. 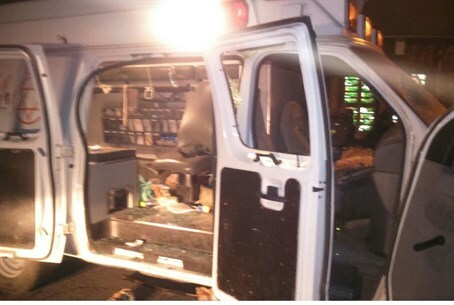 Following an overnight police and Border Police raid on several Druze villages in the Golan, three more Israeli Druze were arrested on suspicion they took part in the "lynch" attack on an IDF ambulance Monday night. The three join the nine suspects arrested Wednesday morning on charges of involvement in the attack. Several of those arrested are suspected of having attacked the ambulance near Majdal Shams in the Golan, while others are thought to have attacked an ambulance in Hurfesh. The incident shocked many in Israel, as one of the Syrian nationals was murdered in the Majdal Shams attack and another Syrian was critically wounded, while the two IDF soldiers in the ambulance were lightly wounded. On Tuesday it was revealed that an IDF soldier may have passed information to the Druze and thereby set off the attack. But according to an ongoing IDF investigation, Channel 2 reported, this does not appear to be the case, as no one was aware of the route of the ambulance, which moved in and out of the area several times daily. The investigation also revealed that the ambulance's driver saw the ambush of vehicles blocking the road, and changed direction to Neve Ativ in an attempt to flee. The biggest mistake found so far, a senior security official told Maariv, was that the gates to the Neve Ativ were not closed after the IDF ambulance fled there for cover. The gap allowed the masses of angry Druze to rush in and surround the ambulance. The soldiers, though, "acted acted exceptionally in this incident, which could have ended in a far more terrible tragedy," the official said. Prime Minister Binyamin Netanyahu met Wednesday with leaders of Israel's Druze community, in the wake of the incident, with both roundly condemning the attack.